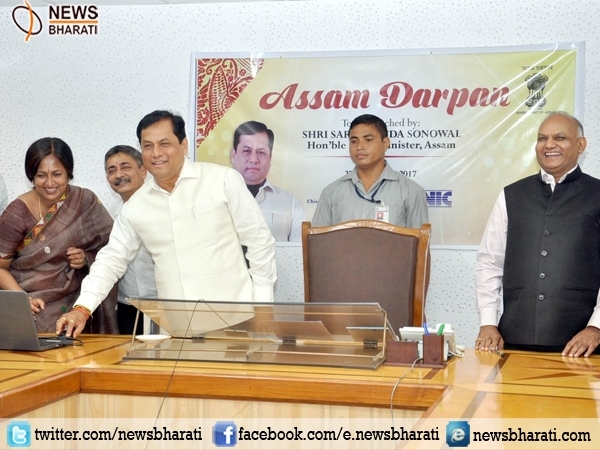 Guwahati, October 28: Chief Minister Sarbananda Sonowal launched a web portal ‘Assam Darpan’ in a programme held at Janata Bhawan with an aim to boost the ‘Digital India’ initiative. This portal will reflect the government’s performance and achievements to the citizens. It has been developed as the Chief Minister’s Dashboard where citizens will be able to see the progress of the flagship schemes of the government. Assam Darpan (httns://as.cmclashboard.nic.in) is available both in English and Assamese. The platform has been developed by the National Informatics Centre, Ministry of Electronics & Information Technology as a part of the Digital India Programme. While launching the web portal, Chief Minister Sonowal said, “Assam Darpan is an important step taken by the government for open, transparent and accountable governance where details of key programmes and projects are made available to the people”. He also expressed the view that the dashboard will help in measuring the outcome and impact of the schemes for taking appropriate and timely decisions and actions. ‘Assam Darpan’ facilitates the presentation of data on key performance indicators of the flagship schemes and projects of the government. In the first phase of implementation, progress indicators of 15 government schemes have been made available in web portal. The schemes included in the portal are National Food Security Act (NFSA), Pradhan Mantri Ujjwala Yojana (PMUY), Amar Dukan, Deendayal Gram Jyoti Yojana, MGNREGS, Pradhan Mantri Gram Sadak Yojana (PMGSY), Swachh Bharat Mission (Gramin), eDistrict Services, Atal Amrit Abhiyan, Fasal Bima Yojna, Land Records, Registration, Chief Ministers Free Diagnostic Services, Vahan and National Rural Livelihood Mission (NRLM).